Reverse, stop or slow down the hair loss process. What is Low Laser Light Therapy (LLLT)? In a study of 100 patients with androgenetic alopecia wearing the LLLT helmet, the results showed overall efficacy at 88% with the effects including decreased scalp sebum, controlled inflammation, improved sleep and 36% new hair growth! Low-level laser therapy (LLLT) is a form of alternative medicine that applies low-level (low-power) lasers to the scalp to encourage hair growth. It can be used alone or in conjunction with other treatments such as medications, PRP therapy or hair products. Hungarian physician and surgeon Endre Mester accidentally discovered that low-level laser light could regrow hair during an attempt to replicate an experiment that showed that such lasers could reduce tumors in mice. The laser he was using was faulty and wasn’t as powerful as he thought. Although it failed to affect the tumors, he noticed that in the places where he had shaved the mice in order to do the experiments, the hair grew back faster on mice he treated compared with the placebos. He published those results in 1967. Since then studies have found that LLLT is able to accelerate blood flow, enhance synthesis of protein, DHA, fibrocyte, and ATP. What are the benefits of the use of this particular iHelmet® Laser Therapy Cap? 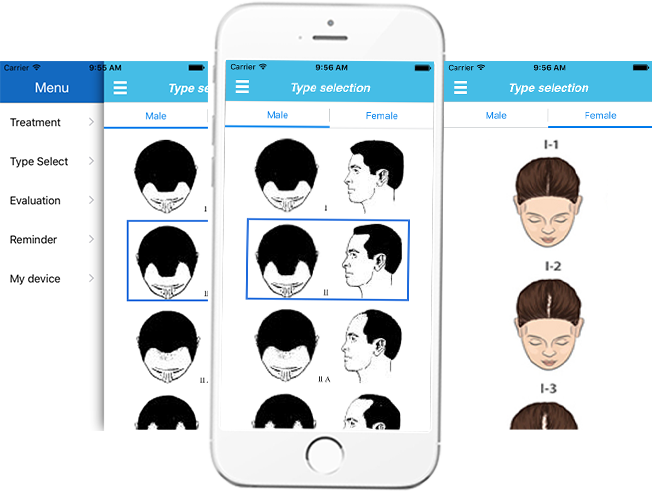 Various types of hair loss patterns can be chosen with the app so that the laser therapy can be applied according to the specific needs of the individual. Includes treatment reminders and will record dates of treatments, as well as evaluate progress with before and after photos. The laser cap stimulates mitochondria to generate ATP. Laser light penetrates the scalp at a depth of 3-5 mm and reach the base of a hair follicle. By healing the base of hair follicles, this proprietary laser technology stimulates the mitochondria of hair cells. The mitochondria then produce cell energy–ATP, which is used by hair follicles. Chung, Hoon; Dai, Tianhong; Sharma, Sulbha K.; Huang, Ying-Ying; Carroll, James D.; Hamblin, Michael R. (2011). “The Nuts and Bolts of Low-level Laser (Light) Therapy”. Annals of Biomedical Engineering. 40 (2): 516–533. doi:10.1007/s10439-011-0454-7. ISSN 0090-6964. PMC 3288797 . PMID 22045511. Hamblin, MR (1 October 2016). “Shining light on the head: Photobiomodulation for brain disorders”. BBA − Clinical. 6: 113–124. doi:10.1016/j.bbacli.2016.09.002. PMC 5066074 . PMID 27752476. Avci, Pinar; Gupta, Gaurav K.; Clark, Jason; Wikonkal, Norbert; Hamblin, Michael R. (February 2014). “Low-Level Laser (Light) Therapy (LLLT) for Treatment of Hair Loss”. Lasers in surgery and medicine. 46 (2): 144–151. doi:10.1002/lsm.22170. ISSN 0196-8092. PMC 3944668 . PMID 23970445. Unlike Light Emitting Diodes (LED), the light of Laser Diodes (LD) will not disperse. The light of LD is coherent and its one-of-a-kind power is potent enough to penetrate hair follicles.